Screen shot from Dunrovin nest. 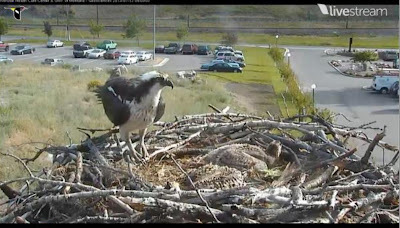 We hope you enjoyed pics from some local (Minnesota) osprey earlier this week. The Cornell Lab of Ornithology has cameras on two different osprey platforms in Montana - just 10 miles apart from each other. The Dunrovin nestlings are about 3 weeks older and nearing fledging themselves. Screen shot from Hellgate nest. 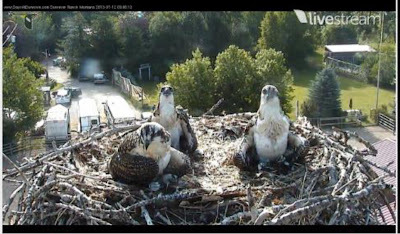 Here is the Dunrovin camera (you can see these chicks have already been banded!). Here is the Hellgate camera. There is sound on both.